This entry explains why Mac Tonic is a potentially unwanted application, how it infiltrates a computer, what the impact is, and how to uninstall it from Mac. There are plenty of reasons why the Mac Tonic utility doesn’t belong inside your Mac. First and foremost, it is a wolf in sheep’s clothing as it purports to optimize the host system and keep it safe from malware but actually behaves like a virus itself. A major giveaway is right on the program’s official website mactonic.net – its support section redirects to a page crammed up with references to Advanced Mac Cleaner, a notorious rogue optimizer that has been wreaking havoc for years. The light-fingered vendor didn’t even bother changing that. The affiliation with the above-mentioned harmful prototype isn’t the only wakeup call. Mac Tonic goes further in its claims – not only does it pretend to be a performance enhancement tool, but also it allegedly delivers security features, pseud ones of course. If it works, don’t touch it – this is probably one of the fundamental principles of the cybercriminals behind Mac Tonic as far as the distribution is concerned. Reluctant to reinvent the wheel, they continue to spread the toxic payload via a vast network of bundling related schemes. In other words, the culprit mainly arrives with multi-component installations, where the core app is benign and even useful, but the additional entities are certainly not welcome. The catch is that the presence of the bundle is not disclosed in a straightforward way, so people move on with their installs while having no clue that something else will creep into their Macs alongside the free Flash Player, video downloader or whatever program is mentioned in the clear. Once the potentially unwanted app is inside the host, it establishes persistence by adding a corresponding object to the login items. This way, the rogue will be launched every time the Mac is booted up. Once executed, the Mac Tonic virus displays a scan that mimics a thorough system traversal in search of redundant startup entries, duplicate files, disk usage issues, failed downloads, Flash bugs, memory malfunctions, as well as security threats. In compliance with the well-trodden tactic of its precursors, the pest will report a slew of problems on the Mac, even if it’s brand new and the user hasn’t had the time to get piles of unnecessary junk onto it. In addition to the recurrent scanning routine, the phony tool will also trigger annoying popup reminders about the numerous issues that were supposedly detected and need urgent fixing. Logically enough, this activity boils down to duping the victim into registering the licensed version of the counterfeit cleaner, otherwise it won’t “repair” anything. Of course this is all bluff and the only right thing to do in such a scenario is uninstall Mac Tonic without hesitation and delay. Here’s what you need to do. The steps listed below will walk you through the removal of this potentially unwanted application. Be sure to follow the instructions in the order specified. When confronted with malicious code like the Mac Tonic virus on Mac, you can neutralize its toxic impact by leveraging a specially crafted system utility. The Freshmac application (read review) is a perfect match for this purpose as it delivers essential security features along with must-have modules for Mac optimization. This tool cleans unneeded applications and persistent malware in one click. It also protects your privacy by eliminating tracking cookies, frees up disk space, and manages startup apps to decrease boot time. On top of that, it boasts 24/7 tech support. 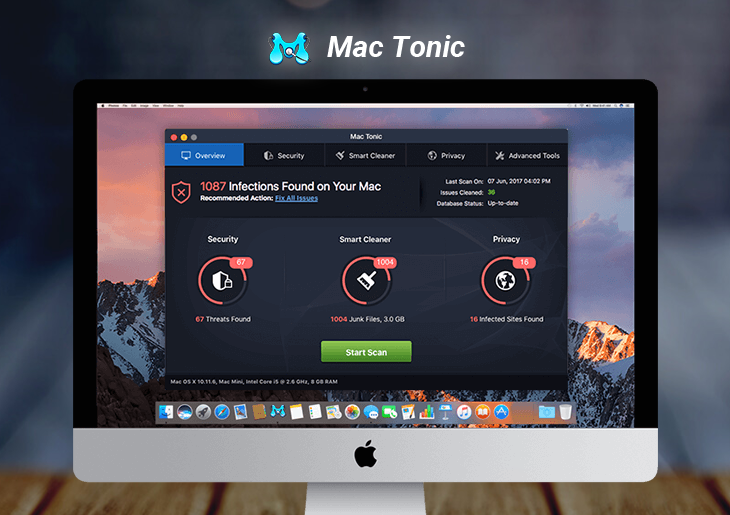 The following steps will walk you through automatic removal of the Mac Tonic infection. 1. Download Freshmac installer onto your machine. Double-click the Freshmac.pkg file to trigger the installer window, select the destination disk and click Continue. The system will display a dialog asking for your password to authorize the setup. Type the password and click Install Software. 2. Once the installation has been completed, Freshmac will automatically start a scan consisting of 5 steps. It scans cache, logs, unused languages, trash, and checks the Mac for privacy issues. 3. The scan report will then display your current system health status and the number of issues detected for each of the above categories. Click the Fix Safely button tto remove junk files and address privacy issues spotted during the scan. 4. Check whether the Mac Tonic popups issue has been fixed. If it perseveres, go to the Uninstaller option on Freshmac GUI. Locate an entry that appears suspicious, select it and click Fix Safely button to force-uninstall the unwanted application. 5. Go to Temp and Startup Apps panes on theinterface and have all redundant or suspicious items eliminated as well. The Mac Tonic malware shouldn’t be causing any further trouble.